Are you eating food? Or merely 'food products?' In the restaurant industry, food and its impact on health is something that we think about often. Food should be nutritious. After all, it is one of the building blocks of good health. We use only natural, carefully selected ingredients, and this is one of our promises to our customers. We also only use non-GMO soybeans. Our brewed soy sauce and rice vinegar are made by contracted manufacturers who are regularly inspected for quality and food safety. Every year we also regularly work with third parties to test our various raw ingredients. Our beliefs on what constitutes good food are what drives us to provide our customers with the safest, healthiest choices possible. In order to serve our customers the best, raw ingredients must undergo strict quality control checks before being considered. 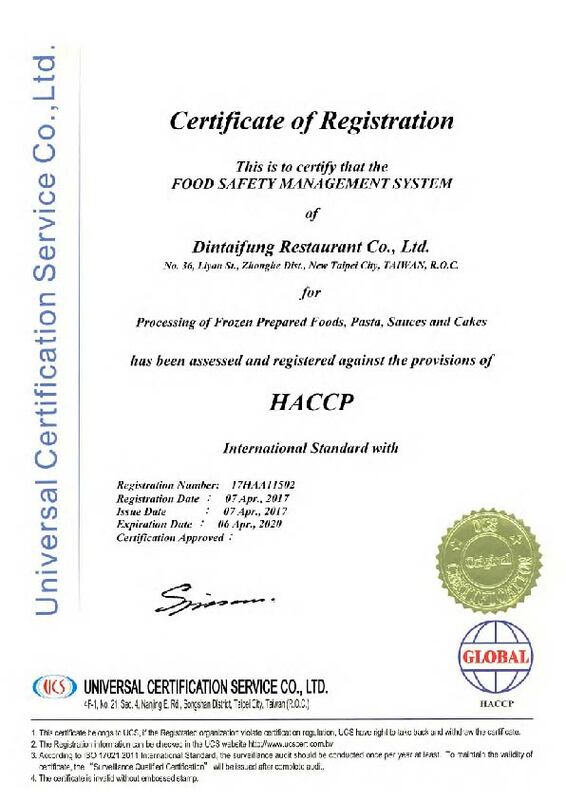 Our in-house quality control officers make use of international food safety management systems and standards from the Ministry of Health and Welfare to ensure that suppliers are in compliance. After an initial review of documents submitted by suppliers, our quality control officers will visit the production site for further inspection of production processes, hygiene practices, food safety risk, and other items. Only those suppliers who meet or exceed our standards will be selected to become official suppliers, and even afterward they will undergo regular evaluations. How do you carry out quality control for shrimp ? In order to keep shrimp fresh we process them in a temperature controlled environment. No preservatives or chemicals are ever used. Regular third party testing for chemicals and heavy metals is conducted to ensure consistent quality. What type of fish is used in your steamed fish dumplings and where is it sourced from ? We use local Taiwanese seabream from a CAS and HACCP certified supplier. What type of chicken do you use and where is it sourced from ? We use free-range local black feather chicken from the Huadong region in eastern Taiwan. Unlike other restaurants our chicken are culled at 16 weeks of age, and they regularly undergo third party testing for chemicals and antibiotics. Where is your pork sourced from ? We use pork from a local CAS certified supplier. All of the pork is locally sourced and pigs are checked by veterinarians before slaughter. They also regularly undergo third party testing for chemicals and antibiotics. Do your noodles contain any preservatives or bleaching agents ? At Din Tai Fung our noodle production process undergoes strict quality control checks and follows GHP international standards. We do not add any preservatives or bleaching agents whatsoever. What type of rice do you use ? For our fried rice dishes we use local Taikeng No. 9 white and brown rice. This type of rice has full, round, slightly transparent grains with an excellent springy texture, perfect for making light and fluffy fried rice. For our sticky rice wraps we use short grain glutinous rice, which adds a pleasantly soft and sticky texture to the finished dish. How do you carry out quality control for cooking oil ? At Din Tai Fung the health of our customers is one of our top priorities. All of our fried dishes use oil with a high smoke point and the oil is checked twice a day for signs of overheating or changes to quality, in line with Ministry of Health and Welfare standards. 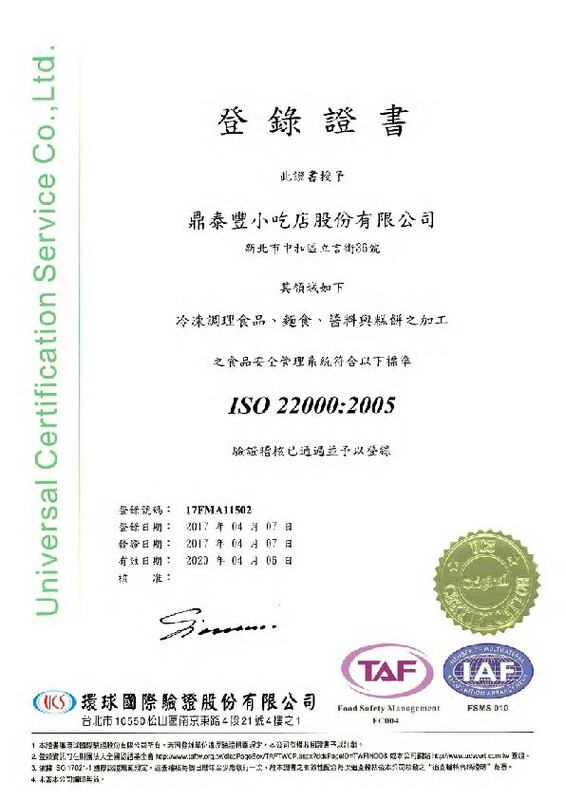 In addition, all of our oil is sourced from an ISO 22000 certified supplier. Where are your eggs sourced from ? We use washed, graded eggs from a CAS certified supplier. All eggs are traceable and are regularly tested for chemical residues. Why does your dried bean curd seem a little too white in color ? Many traditional dried bean curd is prepared with artificial coloring such as caramel color. However our dried bean curd is sourced from an ISO 22000 certified supplier and no coloring is added during the production process, which explains the lighter white color. How is your brewed soy sauce made ? Our brewed soy sauce is made exclusively for Din Tai Fung by a ISO 22000 certified local contract manufacturer. Simply brewed for 180 days, it contains no artificial coloring, no preservatives, and no additives. How is your rice vinegar made ? 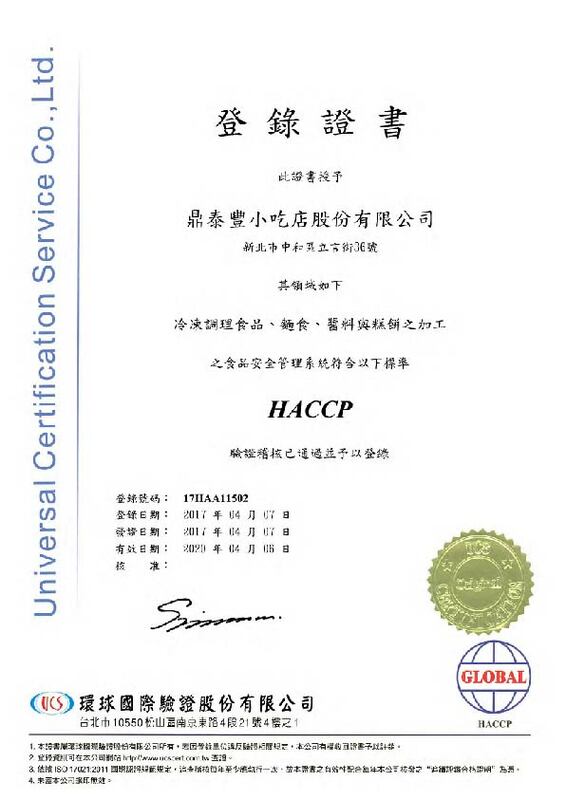 Our rice vinegar is made exclusively for Din Tai Fung by a local contract manufacturer. The production process begins with rice koji, rice wine and vinegar fermentation cultures, and no preservatives or artificial colors are ever added. The vinegar is then left to mature for six months before being bottled. What makes your chili sauce different from others ? Our chili sauce was developed in-house and is made with facing heaven chili peppers and a number of other spices. It has a rich flavor and fragrance, and contains no preservatives. It can be used as condiment to enhance the flavor of your fried rice, noodles and other stir-fried dishes. Is your XO sauce spicy ? Our XO sauce is mostly savory and fragrant with a hint of spice. It was developed in-house by our chefs and is made with scallops and several other ingredients. No preservatives are added during the process, and as such it should be refrigerated after opening. Does your taro filling contain any artificial flavoring or coloring ? Our taro filling is made with fresh taro, and no artificial flavoring or coloring is added during the cooking process, which explains the natural color variation among different batches of taro buns. Why does the red date mooncake filling taste slightly sour ? The filling for our red date mooncakes is made in our Central Kitchen with carefully selected ingredients. No artificial flavoring or coloring is added, but because of the high red date content in the filling, it can taste slightly sour. What makes your eight flavored sticky rice dessert different from others ? Many kinds of eight flavored sticky rice desserts available today use preserved fruits with artificial coloring. We only use natural colors and carefully selected ingredients such as sweetened kidney beans and candied roselle, so that the dish is not just delicious but also visually appealing. How is your seaweed processed ? Most seaweed available today is soaked in potassium alum. Our seaweed is simply soaked in fresh water, which helps it retain its natural green color. What materials are your chopsticks made from ? Our chopsticks are made with Japanese Idemitsu SPS resin and 304 stainless steel. They are certified by SGS to meet international standards and are heat resistant up to 100°C.